Editors are back. When a fan discovered a new track ‘No Harm’ hidden on the current Play It Again Sam compilation and shared it with the world, the first fruit of the band’s recording sessions in the remote Western highlands of Scotland was available to hear. Tracks are now being finalised for a new Editors album in the autumn of 2015, the first to be produced by the band, with Alan Moulder on mixing duties. 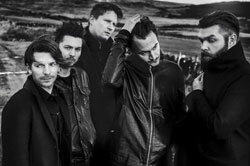 ‘No Harm’ is available to download via the band’s official website http://www.editorsofficial.com, for free, now. Editors’ last album, ‘The Weight Of Your Love’ (2013) was the high watermark for the band in a ten year career that has seen plenty of highlights. Racking up Top Ten placings across Europe, (including number ones in Holland and Belgium and a fourth consecutive Top Ten in the UK), the album propelled the band to headline shows at Werchter and Lowlands in Benelux and high profile slots at Glastonbury and Reading, amongst a list of dates that spanned four continents and over one hundred venues and festivals, including their first ever shows in Africa. ‘The Weight Of Your Love’ followed Editors’ two consecutive UK Number One UK Albums, ‘An End Has A Start’ (2007) and ‘In This Light And On This Evening’ (2009). Their debut album, ‘The Back Room’ (2005) has now sold over half a million copies in the UK alone whilst the band have combined album sales of over 2 million across the world.